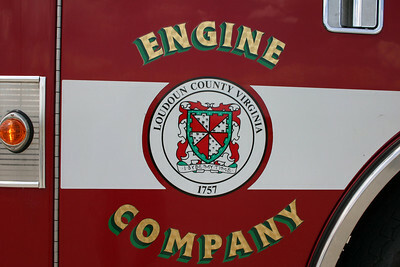 The Loudoun County symbol which began appearing on apparatus in 2016. 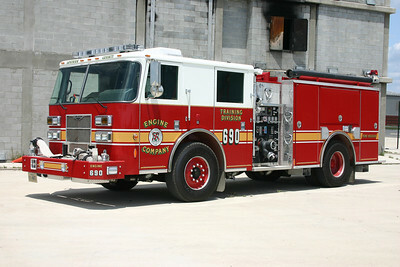 Training Center Engine 690 is one of two identical 2008 Pierce Contender’s equipped with 1250/500. 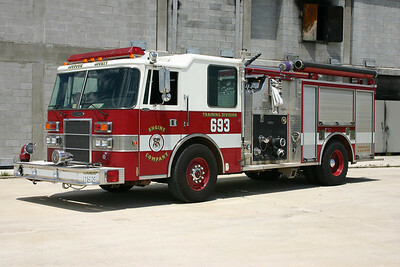 It was delivered with Engine 691 and Truck 690. Fire Apparatus Journal published an apparatus overview of the Training Center apparatus in their March/April 2010 edition. Engine 690's twin.....this one Engine 691. 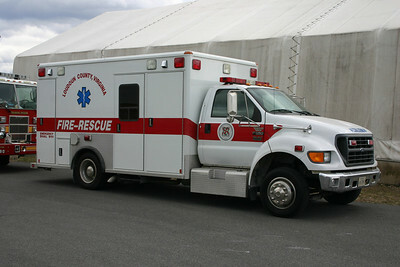 A 2008 Pierce Contender equipped with 1250/500. It was delivered with Engine 690 and Truck 690. 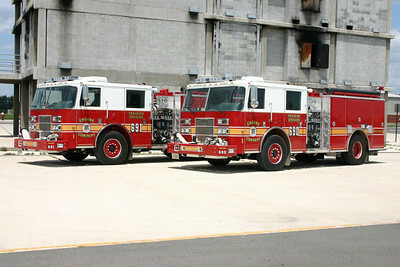 Training Center Engine's 690 and 691 photographed just after delivery at the burn pad. Reserve Engine 699 has made its mark across the county. Originally delivered as the first new Training Center fire engine, this 2002 Pierce Enforcer 1250/750 originally had a see through pump panel so students could see the plumbing behind the pump panel. 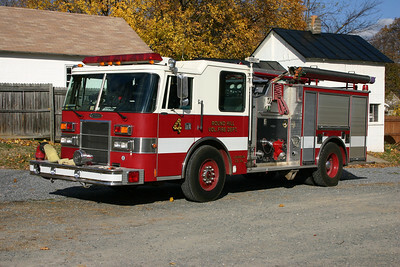 After the Training Center, the Pierce was in service in Neersville as Engine 16. At that time, the pump panel was changed out to a regular one. From Engine 16 it became a county reserve engine. 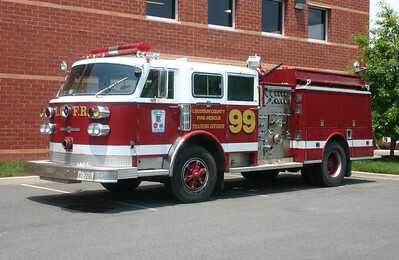 This 2002 Pierce was also the first Engine 623 when the county took over operations at Station 23 in Ashburn. 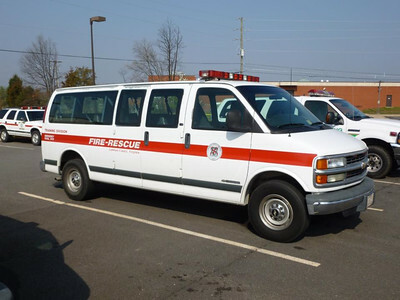 When Station 23 received their new Pierce, the 2002 model became Engine 699 and is kept at the Ashburn warehouse when not being used. This photograph was taken in July of 2012 at the county warehouse in Ashburn. 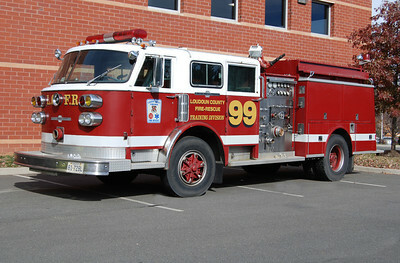 Training Center Engine 99 as photographed in 2002 at the old burn pad. After serving three years as Engine 99, it was re-assigned as Engine 16 in Neersville. 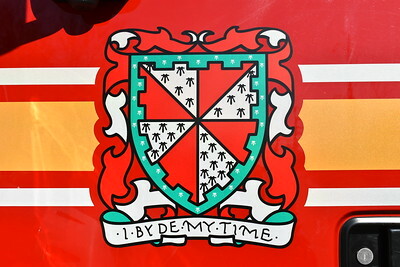 Today, it is a reserve engine in the county fleet. 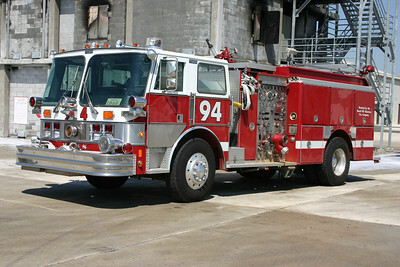 Engine 99 is a 2002 Pierce Enforcer 1250/750. 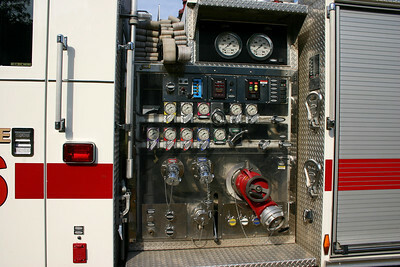 Although it is difficult to see in this photograph, Engine 99 came equipped with a very unique feature - a "see through" pump panel. As a training engine, operators could have a better understanding and a view of the plumbing behind the pump panel. The officer side also had this feature. 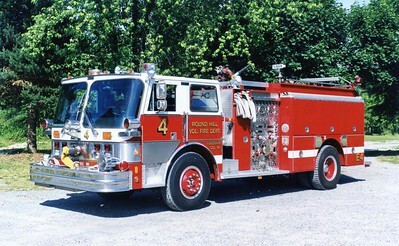 Ultimately, when this 2002 Pierce Enforcer was re-assigned as a county wide reserve engine, the pump panel was switched out to a regular panel. 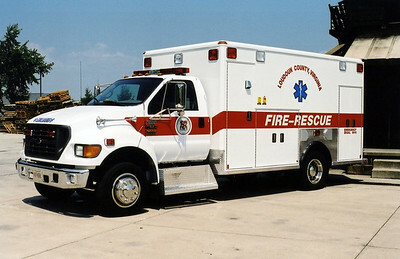 The first new ambulance assigned to the Training Center was this unusual 2002 Ford F650 built by Wheeled Coach. It is currently Ambulance 699. This photograph was taken at the old burn pad shortly after being placed into service. 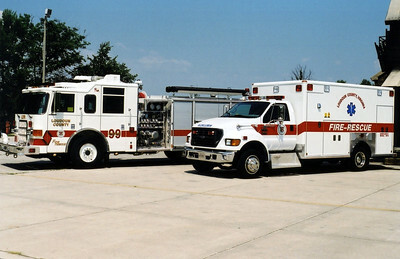 The Training Center's apparatus roster was greatly enhanced with the addition of Engine 99 and Ambulance 99. A new bus for the Training Center was placed into service during 2012. Bus 690 is a 2011 Freightliner M2 built by Champion Bus Company. Bus 690 was photographed at one corner of the burn building. You cannot see it but to the left Truck 690 had its ladder extended and running recruit school 28 through their paces and on the other side of the burn building another group of recruits were going through drills. Captain Brent Harne suggested and managed to squeeze in the long bus for these photos, while at the same time staying out of the recruits way. 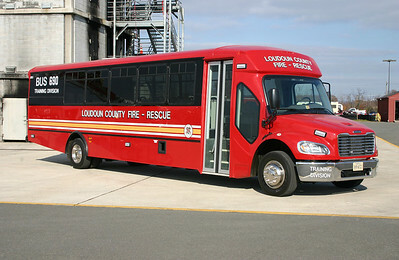 The Loudoun County Fire Department shops did some great work on the graphics and outfitting of Bus 690. I saw it at the shops when it was delivered and looked a bit plain in its red color. The 2011 Freightliner M2/Champion Bus Company has seating for 33 and a larger "cage" area in the rear to hold gear, equipment, etc. Photographed in November of 2012 at the burn building in Leesburg. 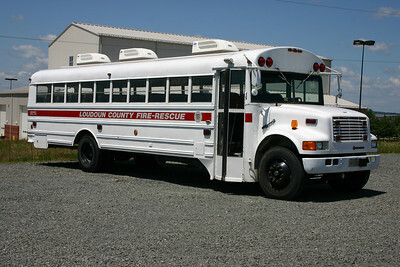 "Bus 699" is an old Loudoun County school bus used to transport recruits and as a rehab unit when needed. 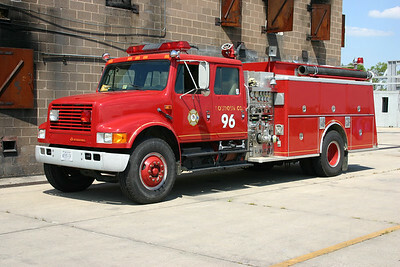 It is a 1990 International that was received by the fire and rescue department in 2004. It is housed at the Training Center. Note the three air conditioning units on top. 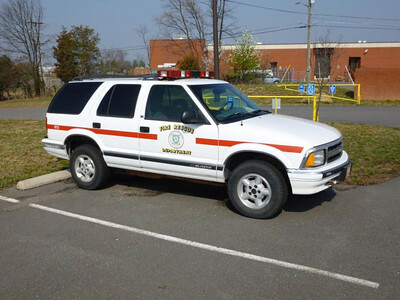 Loudoun's former Command Unit, a former Leesburg VRS ambulance. Former Communications 50, a 1987 Ford F-350. 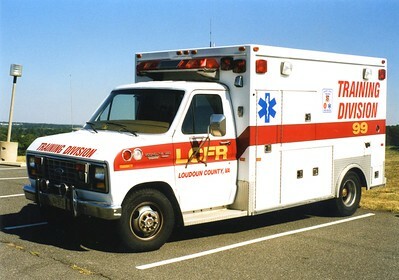 The front of this former ambulance came from the Loudoun County Rescue Squad and the box came from Fairfax County, Virginia. 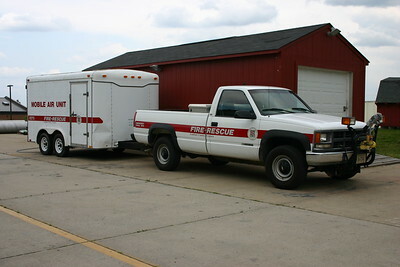 Training Academy utility towing the Mobile Air trailer. Training Academy Chevy Blazer utility. 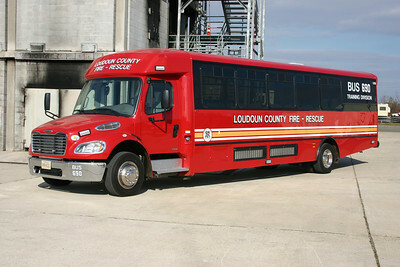 Loudoun County operates a variety of reserve engines, ladder truck, training center apparatus, etc. as part of their fleet. Some of the Training Center apparatus are stored in this "tent". 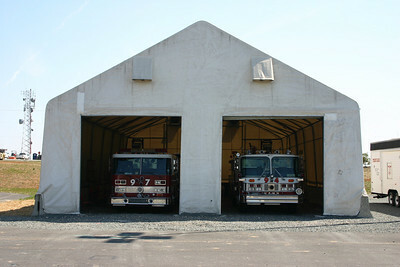 This structure was the original apparatus bays for South Riding Station 19 when it opened in 2001. 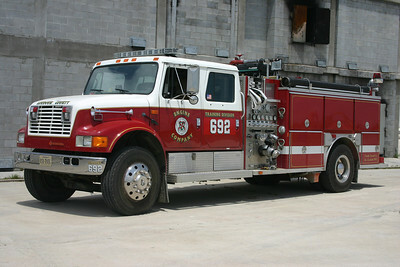 Engine 692 at the Training Center was disposed of during November of 2012. Engine 692 was originally delivered to Lucketts where it ran as Wagon 10. 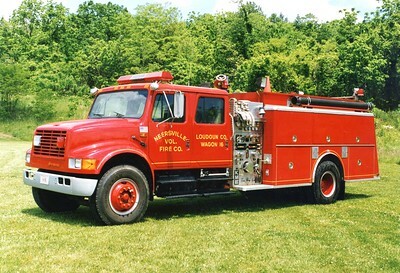 It is a 1991 International 4900/E-One 1250/1000 that was transferred to the Training Center in 2008 after Lucketts placed into service a new county Pierce engine. 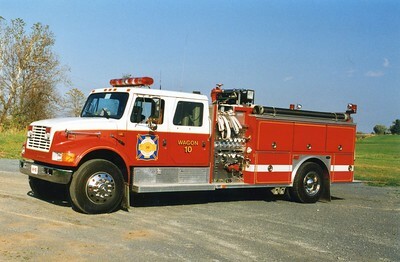 Former Wagon 10, a 1991 International/E-One, 1250/1000, sn- 9578. Given to the Training Academy and became Engine 592. 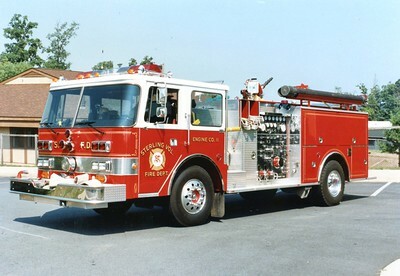 Old Training Center Engine 96 was this 1988 International 4800/1989 KME 1250/1000. 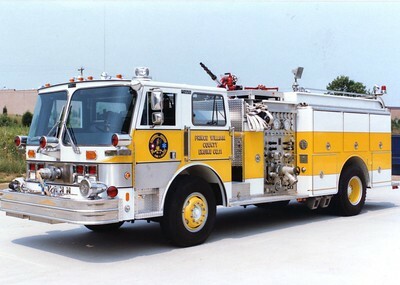 It originally saw service in Neersville as Engine 16 and came to the Training Center in 2005. 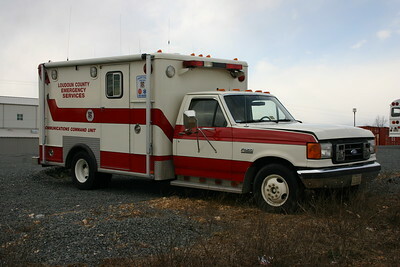 Former Wagon 16, a 1989 International/KME, 1250/1000. 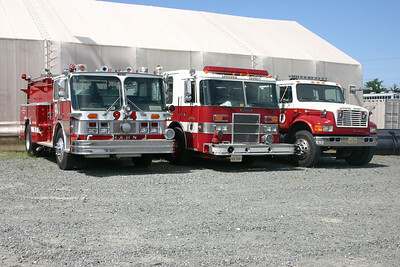 Sterling Fire donated two engines to the Training Center in 2005. 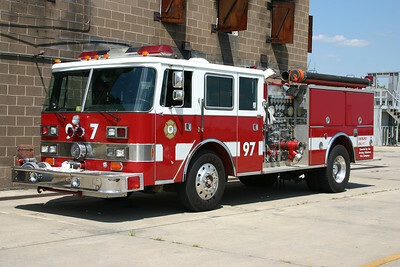 Engine 97 was a 1984 Pierce Arrow that was rehabed by Pierce in 1992 to include the addition of a four door cab. It is equipped with a 1500/750. 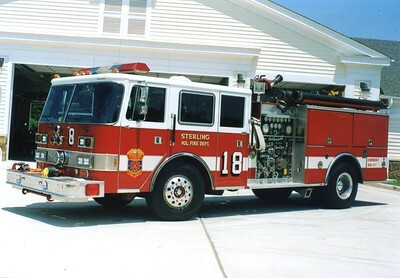 Once its work was completed at the Training Center, Sterling received the engine back and donated it to the Monroe Tech High School in Leesburg. Former Engine 18, a 1984 Pierce Arrow/1992 Pierce, 1250/750. 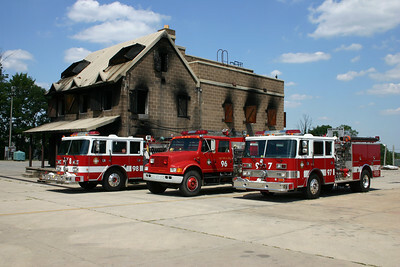 August of 2006 - the old burn house and old Training Center engines - Engine's 96, 97, and 98. A group photo of the three former Training engines as they were on the way out. Old Wagon 99 has re-appeared. In June of 2013 I was surprised to find this 1981 American LaFrance/1990 JC Moore 1250/750 engine sitting at the facility where most maintenance occurs on county fire apparatus. 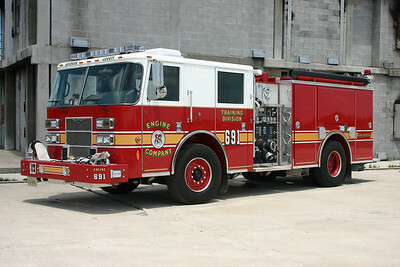 This was the original training center engine and originally was FDNY E-250. The career folks hope to restore the ALF. 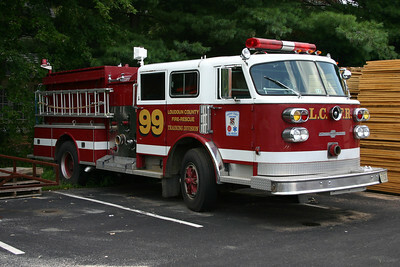 Loudoun County's original Training Engine is still in the Leesburg area. 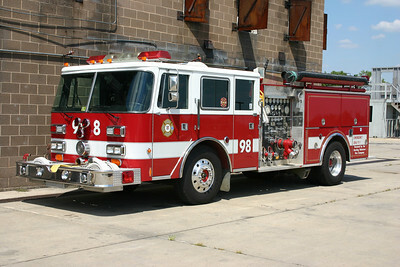 Engine 99 is a 1981 American LaFrance that was originally delivered to the FDNY where it ran as Engine 250. 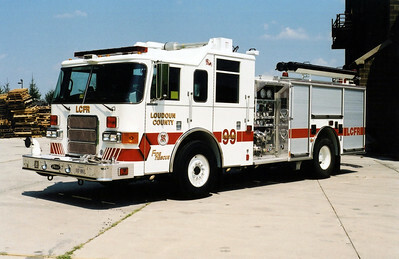 In 1990, FDNY sold the engine to the J.C. Moore Company, who rehabed it and eventually sold it to Loudoun County to be used as a Training Center engine - "Engine 99". 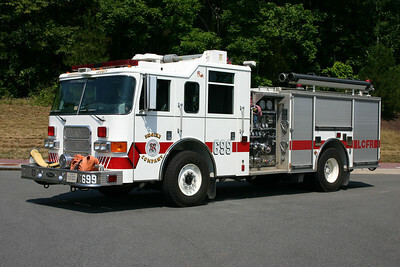 After service at the Training Center, Engine 99 was donated in 2006 to the Monroe Tech High School in Leesburg. 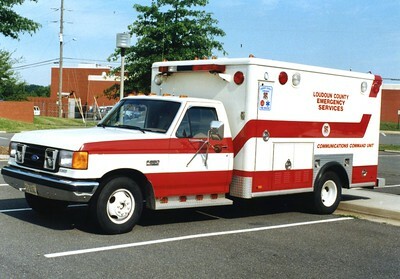 Training Division Ambulance, '99', a 1980's Ford E-350/First Response.